Adrenal support formulas combine herbs, vitamins, amino acids, and hormones like DHEA and pregnenolone. 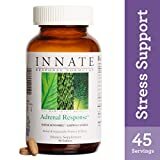 Adrenal support formulas are designed to support the proper functioning of the body's adrenal gland may help the overworked and fatigued adrenal gland to cope better with chronic stress by regulating cortisol production. Adrenal support formulas are most often used to relieve fatigue, chronic stress and reduced resistance to infection. They are available in capsules and liquid extracts.